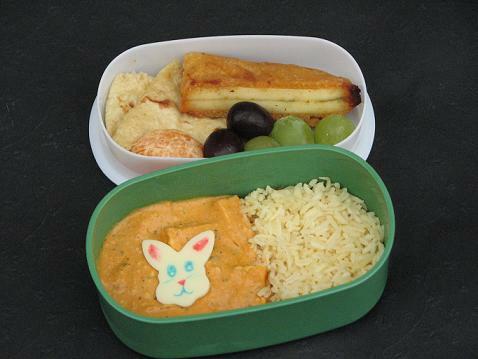 Sad bento containes paneer shahi korma with a cheese bunny and rice on the bottom tier. Top tier includes some kind of fried cheese thing *I forget the proper name*, chapati, grapes, and clementines. And because the rest of this post is so darn depressing, here is something fun! My delicious and amazing birthday cake! It combines my two greatest loves *apart from Kidlet of course* : Star Trek and Hello Kitty!! WOoo :D And it tastes amazing! Oh no! Poor Kidlet :( Best wishes for a speedy recovery! And Happy Birthday! 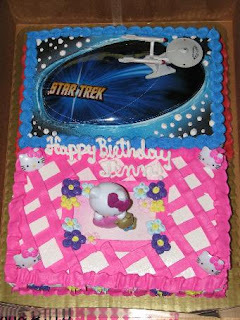 You really can't top the awesomeness of a Star Trek Hello Kitty cake. Oh no, I hope Kidlet is okay! :( Poor guy! The bento looks delicious and I hope you had a wonderful birthday Jenn. And for your birthday cake: Great! I love Hello Kitty and Star Trek, too ^-^ But no one ever made me such a great birthday cake! Poor Kidlet! Hope his foot feels better soon! Cool and super cute cake!! Happy Birthday Jenn. You're too young mom! 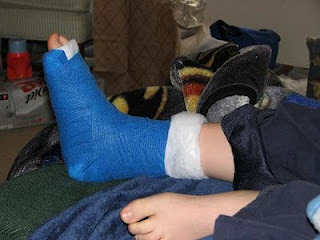 I'm so sorry to hear about Kidlet's foot. I hope it heals properly and quickly! Awww poor little man *hugs*... I hope he is up and at em soon! Commenting again because my husband just can't stop talking about you over my shoulder..."Hello Kitty AND Star Trek! She's SO cool!"... "Wait, she bentos?!"... "Is she your clone? Does she letterbox?"... "Do you have another blog?" LOL Apparently we have a lot in common. Anyhow, he's enjoying your blog too. Haha that's awesome :D A world where loving Star Trek and Hello Kitty makes me cool is a world I want to live in :D woo!